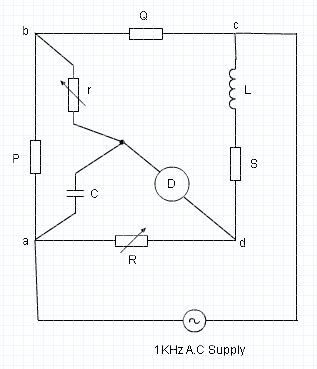 The first figure shows the Anderson Bridge circuit diagram and second figure shows the connections to be made in the kit. It indicates the headphones detector, Galvanometer G, 1KHz Supply, 3V D.C Supply and inductance. Make connections as shown in the connection diagram. Here Galvanometer is the detector and 3V D.C supply is the source to the unknown inductance. Adjust the dial R to get balance point with the galvanometer. Replace D.C supply with A.C supply of 1KHz frequency. Replace the galvanometer with headphones for getting null point. Repeat above steps choosing different values of inductance and capacitance and tabulate the results. Here in the Anderson Bridge, the term Bridge Sensitivity (SB) is defined as the deflection of the galvanometer for unit fractional change in the unknown quantity. 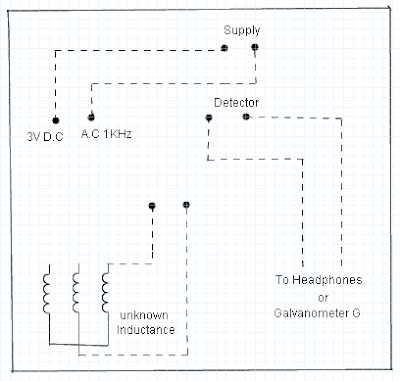 And besides vibrational galvanometers, other 2 types of detectors that are used most are headphones and tunable amplifier detectors. Fixed capacitor is used instead of variable capacitor as in case of maxwell’s bridge. The bridge is used for accurate determination of inductance in terms of capacitance. An additional junction point increased the difficulty of shielding the bridge.